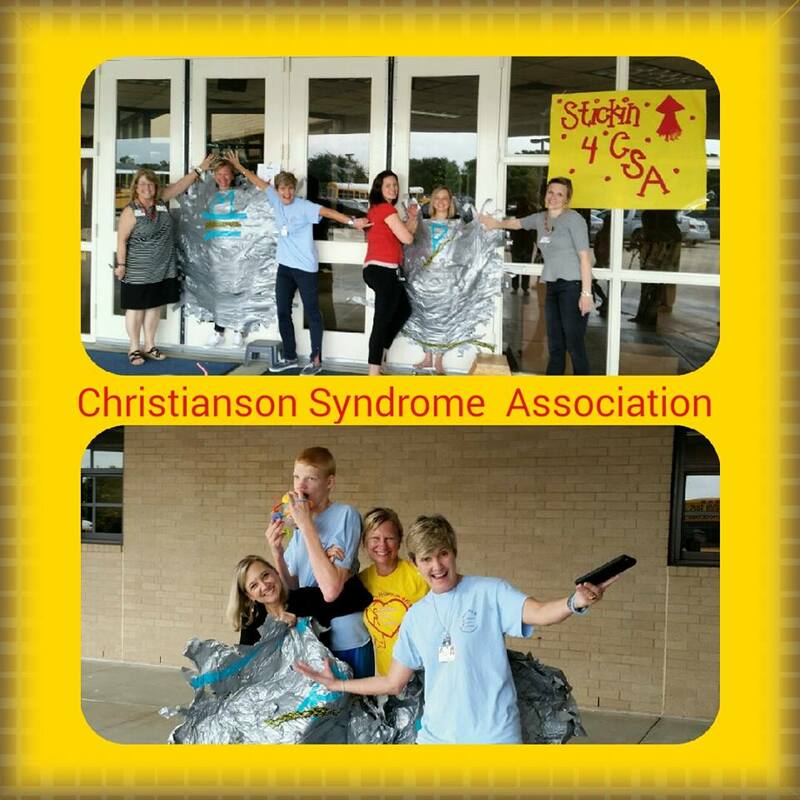 The 1st Annual Cooper’s Carnival: Christianson Syndrome Awareness Day was held on August 15, 2015 at the Harrogate City Park in Harrogate, TN. 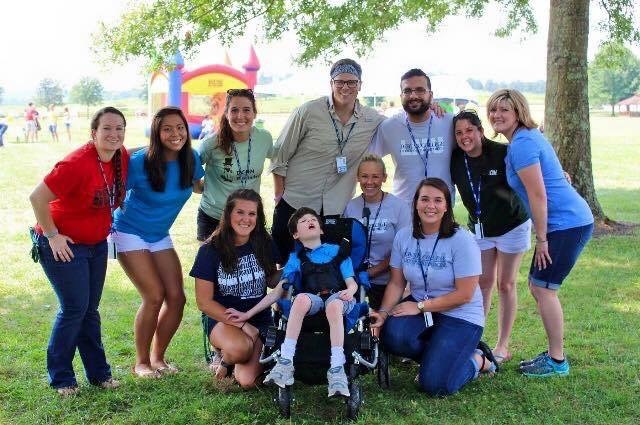 The event was hosted by Lincoln Memorial University-DeBusk College of Osteopathic Medicine student clubs in honor of Cooper Jackson, the only child diagnosed with Christianson Syndrome in the tri-state area. The purpose of the event was not only to raise funds but also to raise awareness about CS. The day was a huge success with dozens of friends, family, and children from the community in attendance. Over $4,000 was raised with 100% of the proceeds going to CSA. The Jackson Family would like to thank all of the students from LMU-DCOM, led by Blair Combs along with the Pediatrics and PASSAGE student clubs, for all of their hard work and dedication that made Cooper’s Carnival an amazing event. Their incredible effort far surpassed all expectations. A big thank you to the Cumberland Gap Fire Department for coming out to show their support and Heavy’s BBQ for donating a portion of their earnings from the day. Lastly, the Jacksons would like to express their gratitude to founder and president of CSA, Debbie Nash, for traveling to East Tennessee to attend Cooper’s Carnival and address all those who were in attendance, including all of our wonderful volunteers who will carry the knowledge of Christianson Syndrome into their own medical practices someday. Once again we are very excited to thank the students and staff of Jowell Elementary school in Houston, TX. The student council voted to once again hold a fund raiser to benefit CSA. 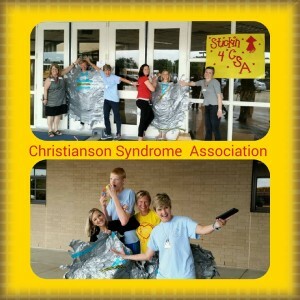 “Stickin Up 4 CSA” raised $1084.55. Thank you to all who participated!!!! “GET YOUR HEART BEATING” was a huge success. Thank to everyone around the world who supported us and got their hearts beating for CSA! We raised over $8,000.00!! CSA is proud to be a part of this incredible opportunity. For more information view the following link. 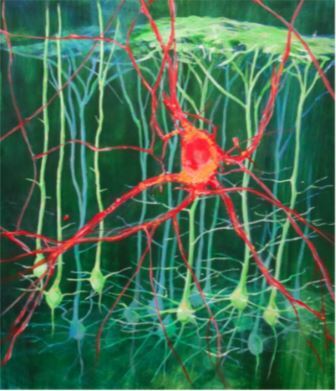 Christianson syndrome (CS) is a newly recognized X-linked neurogenetic disorder caused by changes in the SLC9A6 gene encoding the endosomal Na+/H+ exchanger 6 (NHE6) protein. In accordance with the CSA mission statement regarding the advancement and awareness of Christianson Syndrome. The Ontario Police College (academy) held several fundraisers from the months of January to March. 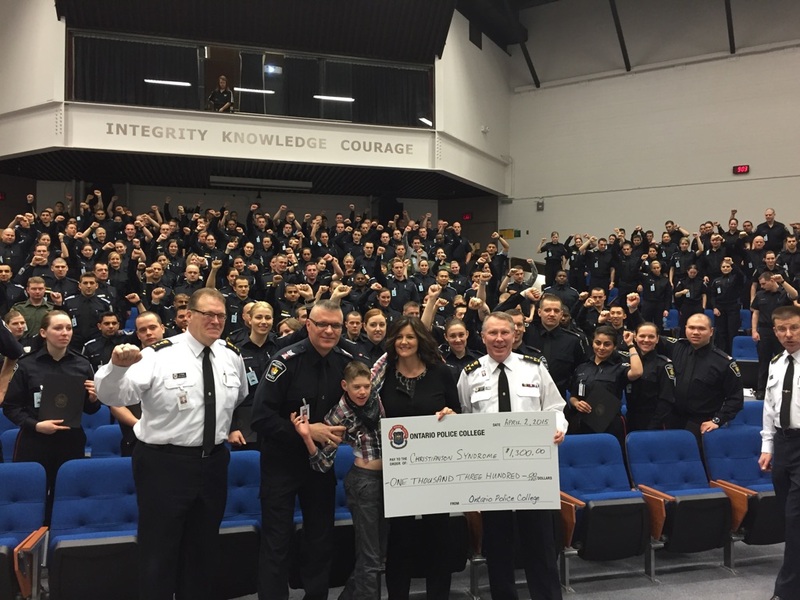 CSA was presented to the Student Committee by Dante’s Dad, Enzo Coletta, an instructor at the college, as a charity option for the Basic Constable Class of January to March 2015 and was chosen as their charity of choice. Over the three months the cadets raised a total of $1300.00 through donations and various fundraising events. The entire college was talking about Christianson Syndrome. 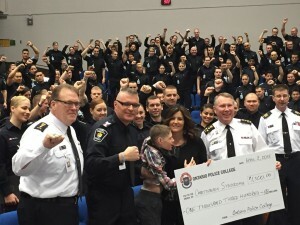 On April 4, 2015, Mom, Wanda with little Dante by her side was presented with a check for $1300.00 by Mr. Bruce Heridge, the Director of the Ontario Police College while the soon to be graduating police cadets held up their bracelets in support of CSA! Thank you Ontario Police College Basic Constable Class of January to March 2015! 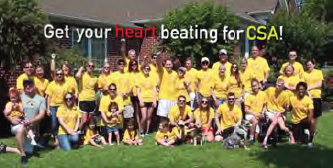 We want you to become a part of Get Your Heart Beating for CSA! This virtual event is so easy. All you need to do is click on the link below, it will take you to constant contact where we have set up a registration page just for this unique event. 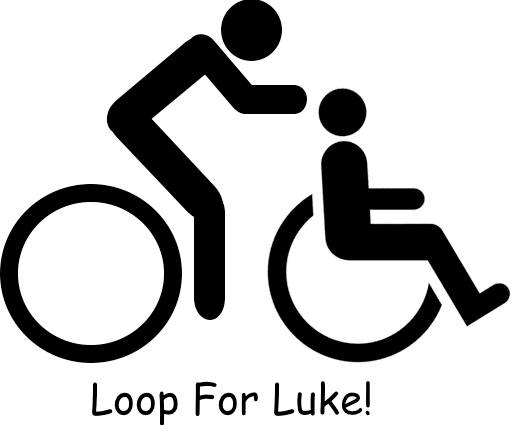 All you need to do is sign up and pay your race fee online and then you go run, walk or bike. You can even create a team of friends, family or co-workers. Everyone will sign up online and then you all can get your heart beating for CSA! With a traditional run/walk or biking event you can arrive at a specific location on a specific date at a specific time. For our race, you start and complete your race on a course and once completed you record your time, take lots of pictures and submit them to us for posting on our website and Facebook page and we in turn will mail you a certificate thanking you for your participation. How to sign up – Click the link below and it will take you right to constant contact to register. Then in the month of May 2015 you can run your own race. Email your photographs to info@csa-cares.org with your name, your teams name (if applicable), your race location, event and time. We work on the honor system so set a realistic goal for yourself and challenge your heart rate for CSA! Register here for Get Your Heart Beating for CSA! If you are unable to participate in our virtual event and just want to make a donation to CSA, please click on the donation button below and in the notes section of PayPal please note that this donation is in honor of Get Your Heart Beating for CSA!